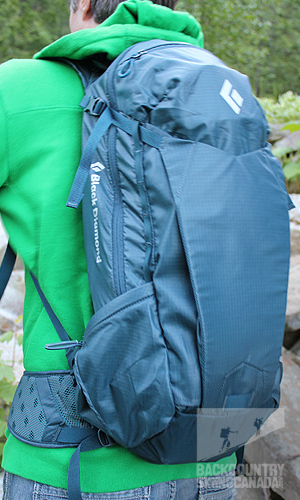 Utah-based Black Diamond has no shortage of backpack offerings. In fact, the company makes about 70 different kinds of packs and that doesn’t include the Gregory line of backpacks, which parent company Black Diamond Inc. owns. 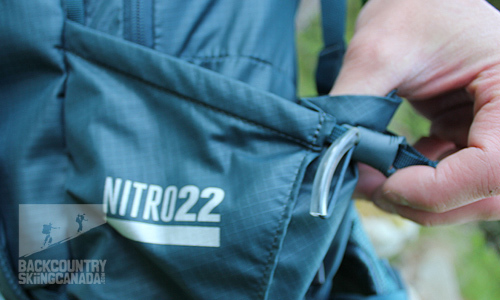 The new Nitro line (which comes in a 22L and 26L versions) is one of the smallest they make (the only smaller ones are the Bullet, Magnum and BBEE) and their intended use is day hiking, although I took mine on a few cragging excursions as well as one multi-pitch rock climbing trip. Being a small backpack, the Nitro doesn’t offer up a lot of features but what it does have is the company’s proprietary “reACTIV” suspension system which is designed to articulate and move with you while you’re hiking over uneven terrain, thus reducing fatigue. Basically, the waist belt and shoulder straps of the pack move with your body rather than remain static so that when you jounce and pivot around rocks and other trail obstacles, the entire load of the pack remains centred. There are stainless steel cables running through the shoulder straps that ensure they remain relatively friction free and the waist belt isn’t affixed to any part of the frame, which means it too can move freely. ReACTIV suspension systems keeps the pack comfortably situated on your body. Trekking pole/ice axe attachment loops. Top pocket is large enough to store a wallet, phone and sunglasses. Front kangaroo pocket is a favourite feature. 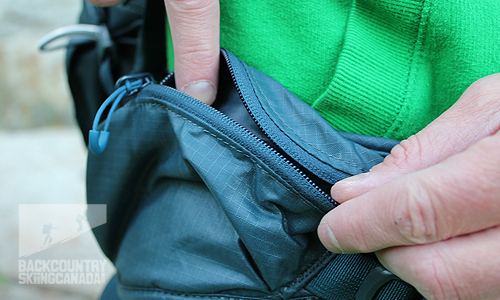 Expandable side pockets can hold everything from water bottles to approach shoes. 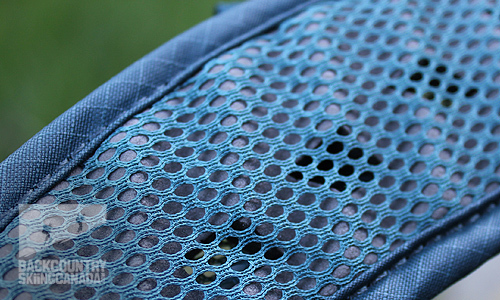 High-flow OpenAir™ backpanel, shoulder straps and waistbelt helps you stay cool while you hike. Convenient zippered pocket on the hip belt. As mentioned above the Black Diamond Nitro backpack is intended for day hiking but I primarily used it for going to the climbing gym or the sport crag. 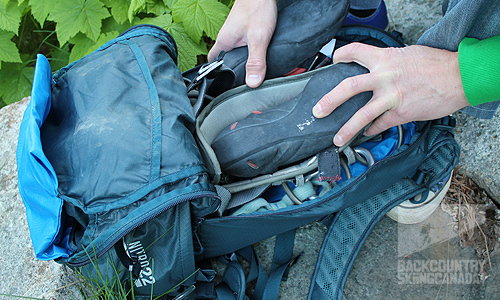 It perfectly fits a harness, shoes, a set of quickdraws, chalk bag, water bottle and lunch. The few times that I packed in the rope, rather than my partner, I slung it over the top of the pack and used the compression straps to cinch it down, which worked fine although the added weight made the pack a bit unwieldy and the reActiv suspension system didn’t work very well. For that reason, and the fact I couldn’t fit a first aid kit or trad rack in it, the Nitro isn’t the ideal solution for rock climbing. That said, on the day that I took it on a multi-pitch climb, I found it comfortably held my water bladder and approach shoes (I was wearing all my climbing gear) and stayed put while I swung over a roof and wandered up slab. 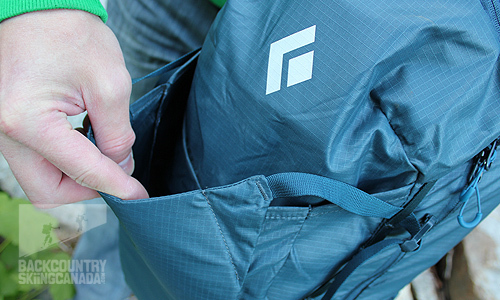 At the outset of this review I mentioned that the backpack doesn’t have a lot of features but after using it for a month I’m going to correct that statement: the Nitro has just the right amount of features. It offers trekking pole attachment loops, a waist belt pocket, two expandable side pockets and a water bladder sleeve (which I only used once, preferring to stick with a water bottle so I could insert more gear into the main pocket chamber.) My favourite feature of the Nitro backpack, though, is the exterior kangaroo pocket that I ended up using for everything from a thin shell jacket to my bike helmet. 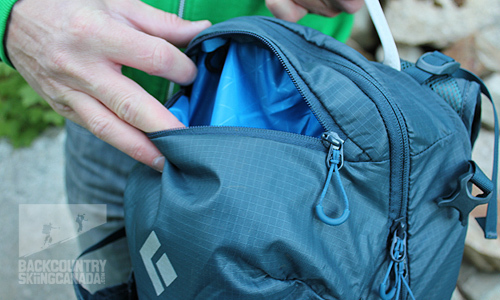 The pack also has a top pocket that’s large enough to store a wallet, phone and sunglasses. As for the main pocket, I liked that it offers a panel access so I can open it up and see everything that’s inside rather than having to root down through all the gear like you you do with a top-loading system. I’ve had a chance to use other Black Diamond packs that offer the reACTIV suspension system and I’ve only had good things to say about it – when hiking up talus or moving laterally through rock climbing holds, I was impressed with how the pack moved with me and not against me. The big plus with the Nitro backpack is the high-flow OpenAir™ back panel, shoulder straps and waistbelt. Despite being extremely cushioned and comfortable they don’t trap heat and so, even on the most humid days, my back and shoulders felt perfectly ventilated. What this system offers in comfort, though, it also means more weight, which is why the 22L version tops out at about 900 grams or almost two pounds. Finally, I have to speak to the 210d ripstop Nylon and 201d Dobby fabric which gives the backpack a beefiness that you’d expect from heavier models. My backpacks take a beating because I’m usually whacking them against trees while bushwhacking, tossing them into the dirt at the base of a climb, or bouncing them off granite at belay stations and the Nitro held up perfectly. In fact, despite all the use it’s been getting lately, I can’t see any wear on it whatsoever. 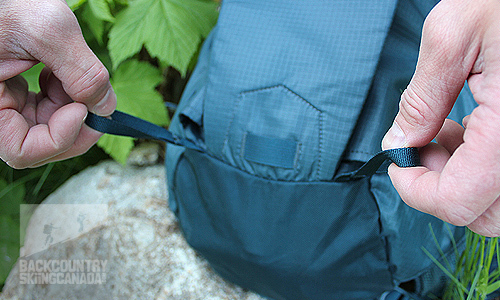 Overall, my verdict is that the Black Diamond Nitro 22 is a comfortable, well-featured backpack that is perfect for day hikes or carrying your climbing gear to the gym and sport crag. 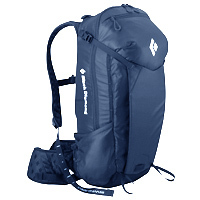 The price is a bit steep for a small pack but, given it’s durability I believe it’s worth it. Comfortable. The reACTIV suspension system allows for excellent range of motion and the high-flow OpenAir™ back panel, shoulder straps and waist belt ensure good ventilation. 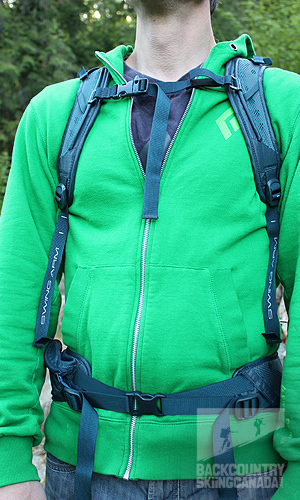 Also, the front kangaroo pocket is an amazing innovation. It’s a bit expensive for a small daypack.